Today is the opening of the Wisconsin State Fair, and Cream Puffs are the one treat at the fair that should not be avoided. The Wisconsin Bakers Association runs the operation, the State Fair handles the marketing, and for 24 hours a day for the 11 days of the Fair, they turn out over 50,000 of these delicious treats each day. If you’re unable to make it to the fair, you can try out the recipe found here. A lesson on how NOT to eat a Cream Puff can be seen here. This bridge is the first moving bridge that boats and ships pass through on the way from Lake Michigan to the Milwaukee River and downtown. 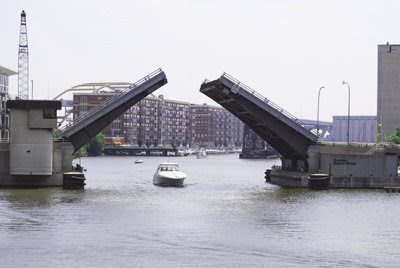 It is a bascule style of bridge, which means that it is counterweighted to assist the opening and closing of the bridge. 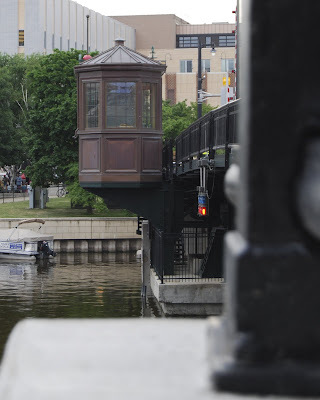 While it is called the Broadway Bascule Bridge, it is actually on Young Street, which connects Pittsburgh Street on the west side of the river with Milwaukee Street on the east side. Many of the bridges over the river cross at strange angles, due to the fact that many of the streets on the east and west sides were intentionally built so that they could not be connected. More on that some other time. Today, it's an Irish Pub on the corner of Water and Erie Streets in the Third Ward. When it was built in 1904, it was a Saloon and Boarding House. Many taverns from this period were built with the support of the breweries whose product they served, and it is reflected in their ornamentation, as seen here. 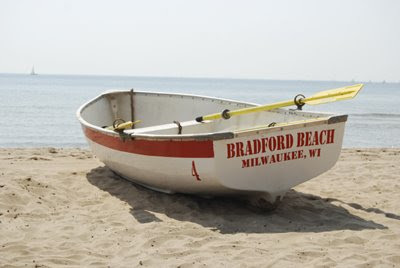 After being unused for a number of years due to poor beach and water quality, Bradford Beach is back! The Beach House is open every day, and you can check out volleyballs, nets, soccer balls, beanbag games and beach toys for free! The concession stand is open, and there are lifeguards in their stands. They even have free WiFi! Thanks to Miller Brewing and a number of private donors, the beach maintenance will be paid for through at least the next five years. 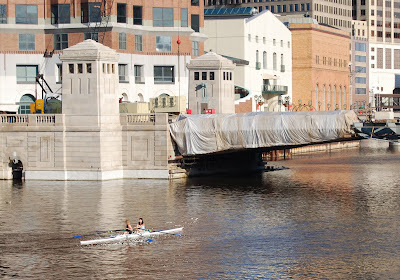 These two women are rowing on the Milwaukee River, just north of the Kilbourn Street Bridge. The bridge is currently under repair. The weather is still great, so get outside and enjoy it... I'll be out today taking more pictures for MKEDP! 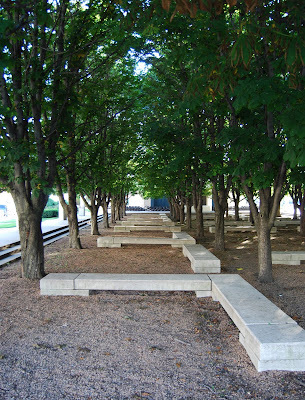 This greenspace is adjacent to the Marcus Center for the Performing Arts, which is downtown. The Marcus Center features a number of performing spaces, and is the home of the Milwaukee Symphony Orchestra and the Milwaukee Ballet, as well as a number of other groups. In the background of this picture, you can see the Peck Pavilion, the Center's covered outdoor stage. 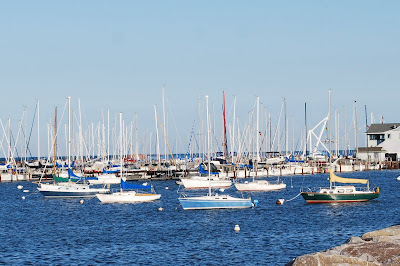 It has been one of those weeks in Milwaukee where we have been blessed with fantastic summer weather; warm, sunny and dry, with cool breezes coming off the lake. After I took Wednesday's picture, I walked over to the park adjacent to the South Shore Yacht Club, and spent some time enjoying the evening. SSYC has been around since 1913, and is the largest Yacht Club in Wisconsin. From small sailboats to powerboats, and everything in between, the club provides recreational, social and educational opportunities to the boating community. 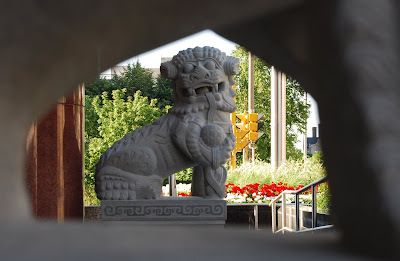 This past Monday (July 21), representatives of the city of Ningbo, China, were on hand to help unveil two carved stone lions to the city of Milwaukee. Ningbo and Milwaukee have established a "Friendship", but have not been designated as Sister Cities. The lions stand guard at the Zeidler Municipal Office Building downtown. The male lion (shown here) stands with one paw holding a ball, as the guardian of the building. The female lion stands with one paw holding a cub, as the protector of the people within. In addition to the presentation, a 30-member trade delegation from Ningbo attended a trade conference hosted by the Metropolitan Milwaukee Association of Commerce. I had to rush to make it in time, but I was able to catch this shot of the Lake Express Ferry as it docked at its home on Milwaukee's South Shore last night. I had no idea that the ferry would come as close to shore as it did, or that I'd be able to get a shot like this. 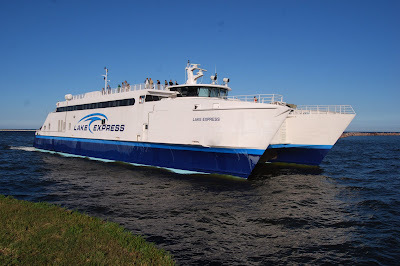 The ferry travels between Milwaukee and Muskeon, Michigan, and makes three round-trips daily in the summer, and two round-trips in the spring and fall. It will save you some time on your trip to the other side of Lake Michigan, but it is rather expensive. 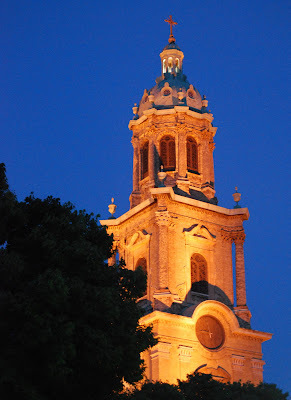 The Cathedral of St. John the Evangelist is the Mother Church of the Archdiocese of Milwaukee. It sits next to Cathedral Square Park downtown. Construction was begun in 1847, and completed in 1852. Its exterior is primarily made of "Cream City" brick, a feature found in many local buildings. The cathedral is open for self-guided tours. I have never been inside myself, but I'm looking forward to seeing it soon! Gertie the Duck lived under the Wisconsin Avenue bridge in the spring of 1945, and made a nest on one of the pilings under the bridge. When she laid eggs in the nest, she began to attract the attention of the locals that crossed the bridge regularly, word began to spread. As World War II was fresh in everyone's memory, Gertie and the nest were a welcome diversion. This sculpture depicts Gertie and her 5 chicks, apparently on a canoe trip. 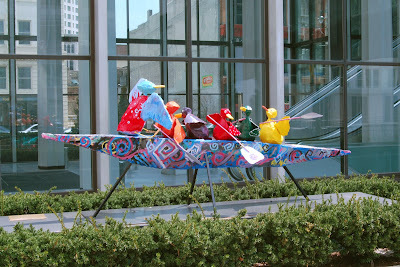 : ) There is also a set of bronze sculptures that depict the ducks on the Riverwalk. 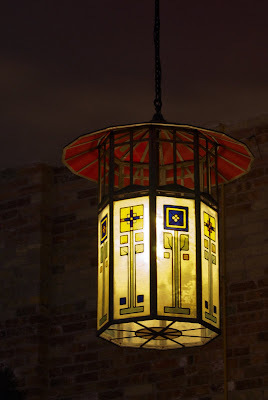 This light fixture hangs from the ceiling of the Palm Garden at the Lakefront Brewery. 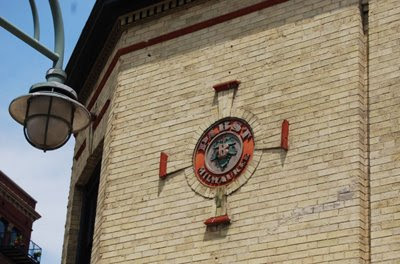 Lakefront has brewery tours and has a Friday night Fish Fry - a Milwaukee tradition. Unlike the tours at Miller, Lakefront serves beer tastings before, during, and after the tour. The fee for a tour gets you a discount on gift shop merchandise or a free pint glass as well, so be sure to save your cup! This lookout is on the State Street Bridge over the Milwaukee River. Before the bridge was automated, the bridge tender would sit in this lookout and wait for boats to come by, and the tender would open and close the bridge to allow the boats to pass. Today, the bridge is opened and closed automatically, and the tender is no longer needed. The lookout now houses the electronic controls that control the bridge. 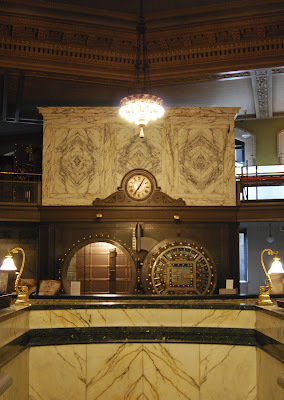 Once upon a time, the home of the Milwaukee County Historical Society was a bank. The building was selected to play that role again when the cast and crew of "Public Enemies" came to town to film a scene featuring star Johnny Depp, as he robs the bank. The movie, which also stars Christian Bale and Marion Cotillard, is currently scheduled for release on July 1, 2009. 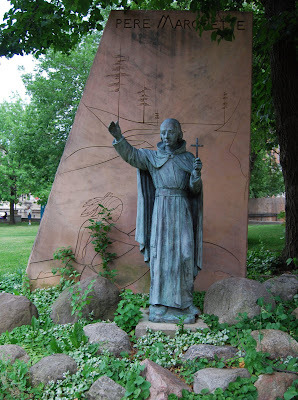 Father Jacques Marquette was a French Missionary originally assigned to Quebec by the Society of Jesus to teach Native Americans. In 1673, he joined up with explorer Louis Joliet and they traveled the Great Lakes and Upper Mississippi. During these travels, he visited the area now known as Milwaukee. A park downtown bears his name, and this statue is in the park. 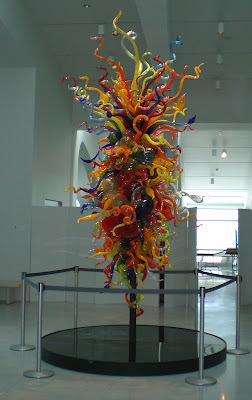 Dale Chihuly is one of my favorite artists. His glass sculptures borrow from organic forms, and so many of his works feature bright, vibrant color. This piece, "Isola di San Giacomo in Palude Chandelier II" is in the collection of the Milwaukee Art Museum, which sits on the lakefront downtown. Summer's in full swing, and that means a lot of traffic at the Riverwalk, which runs along both sides of the Milwaukee River downtown. 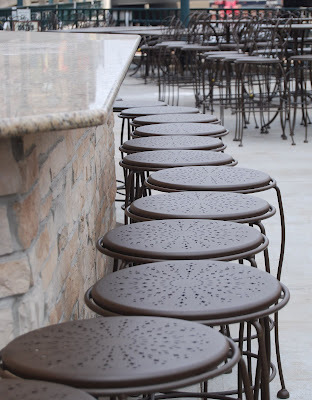 This picture was taken on the patio of the Rock Bottom Restaurant and Brewery, which is part of the Riverwalk. A perfect place to stop for a refreshment on a hot day and watch the world go by on land and water! Friday and Saturday, the Milwaukee Mile was host to the 2008 Miller Meet. 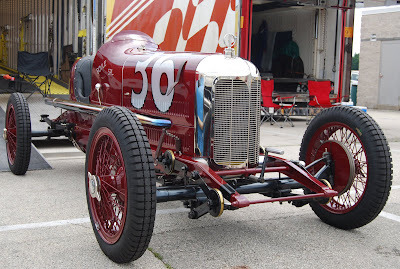 Many of the vintage cars at the meet were past participants of the Indianapolis 500. In addition to the static displays, many of the cars took to the track and provided the spectators a chance to see these works of art in action. Bastille Days is a celebration of all things French, located at Cathedral Square Park, and run by the East Town Association. 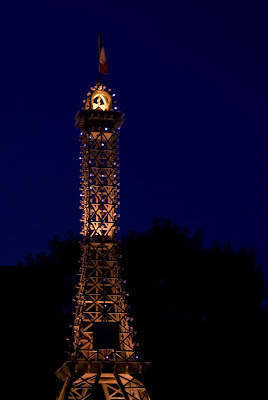 One of the centerpieces is this 43-foot replica of the Eiffel Tower. 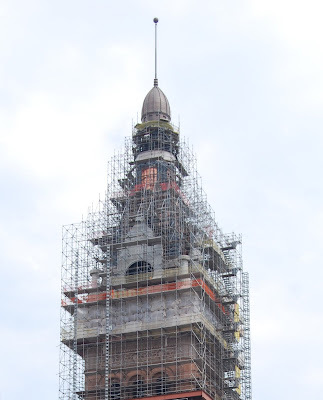 The students of the Milwaukee School of Engineering (whose campus is adjacent to the park), build and maintain the tower. Just like the real thing, this one twinkles at night!